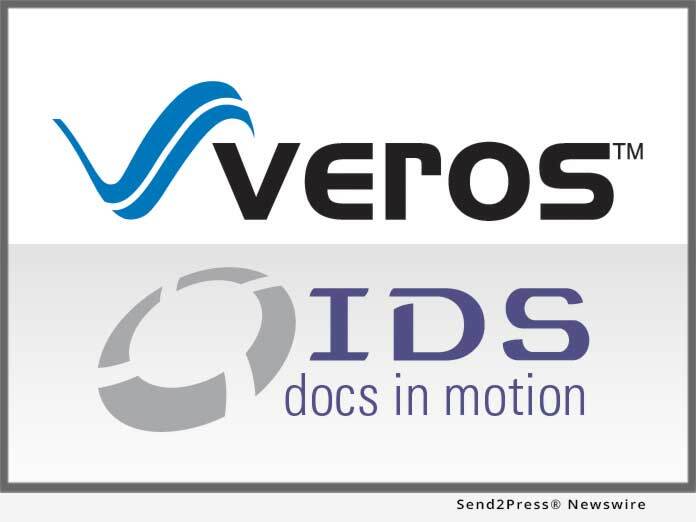 SANTA ANA, Calif., Apr 16, 2018 (SEND2PRESS NEWSWIRE) -- Veros Real Estate Solutions (Veros(R)), a leading developer of enterprise risk management, collateral valuation, and predictive analytics services, and mortgage document preparation vendor International Document Services, Inc. (IDS) announced today that they have partnered to provide lenders with a fully integrated automated delivery solution for submitting the Uniform Closing Dataset (UCD) to the Government Sponsored Enterprises (GSEs). The Veros and IDS partnership creates a fully integrated UCD data file creation solution and submission solution. By offering lenders a single, integrated solution - similar to the Uniform Collateral Data Portal (UCDP) - and combining IDS's UCD XML file creation capability with Veros' Pathway UCD submission system, both Veros and IDS ensure full compliance with the GSEs' June 25, 2018 mandate. "IDS is widely recognized as a leader in the mortgage document preparation space, and we are pleased to partner with them to provide lenders with a single, integrated solution to ensure compliance with the GSEs' upcoming UCD data submission requirement changes," said Robert Walker, CMB, CMT and Vice President of Sales at Veros. According to a January 30, 2018 joint announcement made by Fannie Mae and Freddie Mac, warning UCD edits in the GSEs' respective delivery systems related to non-submission or unsuccessful UCD submission will become critical or fatal effective June 25, 2018. In addition to the edits that will turn fatal in the GSEs' delivery systems, the UCD warning edit for embedding the PDF will also convert to fatal, resulting in a "Not Successful" status, as of the June mandate. Both GSEs are recommending that lenders prepare for the change by submitting "Successful" UCD files prior to delivering their loans, as appropriate. In response to the joint announcement from January, IDS has updated its proprietary idsDoc platform to support the directive and issued a press release on April 11, 2018 urging lenders to begin troubleshooting UCD files that resulted in a "Not Successful" status. "IDS has been gathering feedback from our clients in an effort to error-proof the UCD submission process before the upcoming changes," added Matthew Mackey, Director of Sales and Marketing at IDS. "Veros' expertise in working with automation and providing the technology powering the UCDP make them an excellent partner not only in this endeavor, but also in our overall goal to make idsDoc as seamless and efficient as possible for our clients." For more information about the IDS and Veros UCD solution, contact Matthew Mackey at 800-554-1872, ext. 134 or matthew@idsdoc.com. Mortgage technology innovators since 2001, Veros is a proven leader in enterprise risk management and collateral valuation services. The firm combines the power of predictive technology, data analytics, and industry expertise to deliver advanced automated solutions that control risk and increase profits throughout the mortgage industry, from loan origination to servicing and securitization. Veros' services include automated valuation, fraud and risk detection, portfolio analysis, forecasting, and next-generation collateral risk management platforms. Veros is also the primary architect and technology provider of the GSEs' Uniform Collateral Data Portal (UCDP) and FHA's Electronic Appraisal Delivery portal (EAD). For more information, visit http://www.veros.com/ or call 866-458-3767. IDS, a Reynolds and Reynolds company, was founded in 1986 in Salt Lake City, Utah, and is a nationwide provider of mortgage documents and compliance. IDS services include electronic signatures, closing documents, initial disclosures, document fulfillment and integration with leading loan origination systems and eClosing platforms. The IDS flagship doc prep solution, idsDoc, is recognized in the industry for its ability to be customized to meet specific lender needs, particularly in regards to major industry compliance changes. Learn more at: http://info.idsdoc.com/.